Camping is one of the most popular recreational activities in British Columbia, and campgrounds in the Similkameen Valley are as varied as the beautiful terrain in which they are located. The magnificent provincial parks are always a real camping highlight, but if you want to rough it, you can pitch tents in private campgrounds and in BC Recreation Campsites located on Crown land, There are seven Provincial Parks nestled along scenic lakes and rivers in the Similkameen offering drive-in camping and tenting experiences and plenty of stars overhead. Many of these parks make a great get-away that's within a three hours’ drive from Vancouver. Read on below for detailed information on all these parks that offer camping to travelers in the region south of the Okanagan Valley. Located 5 minutes East of town on Highway 3. The Princeton RV Park consists of 73 RV and tent sites located right beside the beautiful Similkameen River with easy access to the Highway 3 in either direction. The park is situated in a well balanced mixture of trees for shade sites and open areas for sites and other activities. All the sites are well serviced with 15 & 30 amp power and water plus a central facility for showers, flush toilets, ice and much more. The park is pet friendly as well. WIFI is available for those that need to stay in touch with their traveling colleagues or family at home. Manning Park is a unique year round destination in BC offering accommodations, retail & recreational services & facilities. Located in the heart of the Cascade Mountains the park features rain forests on its west side, grassland slopes on its east side, and between the two extremes lies a land of wild rivers, crystal lakes, towering peaks, and alpine meadows. The park is within a three hour drive from either the Lower Mainland (Vancouver) or the Okanagan. Bisected by Hwy. 3, Manning Park is one of the most popular four season destination areas in the province with driving access to the alpine. Hiking trails are its chief draw, but the park also offers horseback riding, swimming, canoeing, fishing, mountain biking, and, in winter, cross-country and downhill skiing. It is also the end point of the Pacific Crest Trail spanning from Mexico to BC. The park contains a large number of scenic, historic, floral and fauna attractions and provides a wide range of both summer and winter recreational opportunities. 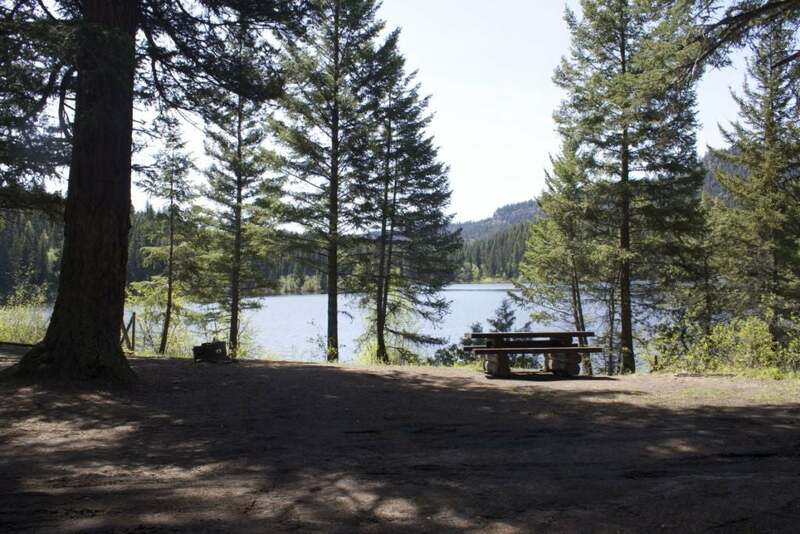 There are four main camping areas: Hampton Campground, Mule Deer Campground, Coldspring Campground and Lightning Lake Campground. The latter is especially popular during the summer months. The park’s western entrance is 26 km east of Hope, its eastern entrance 48 km southwest of Princeton. Winter features: winter camping, snow shoeing, Nordic and Alpine skiing, skating and tubing. Summer features: camping, hiking, biking, horseback riding, bird and wildlife watching, fishing and canoeing. Facilities: 355 vehicle accesible campsites at 4 campgrounds - Lightning Lakes (143 sites), Coldspring (64), Hampton (99), Mule Deer (49). Ten wilderness backcountry camping areas (55 sites) include Buckhorn, Frosty mountain, Grainger Creek, Kicking Horse, Mowich, Nicomen Lake, Pacific Crest, Poland Lake & Strike Lake wilderness campsites. Lodge and cabin resort (41 guest rooms 6 meeting rooms plus full amenities) and 25 Cabins. Day-use area, group sites, flush toilets, showers and sani-station. Day-use pay parking is in effect. Location: The western entrance is 26 km east of Hope and the eastern portal is 52 km west of Princeton on Highway 3. For more information check out: ManningPark.com & BC Parks websites. If you’re looking for privacy in a natural setting, Otter Lake is ideal for old-fashioned camping. The popular park has two locations: a main picnic/day-use area in the village of Tulameen and a lakeside campground about 5 km further north along Coalmont Road. The Cascade Mountain Range surrounds the park and includes awesome canyons and clear flowing streams. Large numbers of otter, beaver and red squirrel inhabit the area, as well as, mountain goats, cougars and grizzly bears. Fishermen will find time spent on Otter Lake rewarding, with large lake trout being the catch of the day. The scenic lakeside campground is an ideal base for those who want to explore the mining history of the Tulameen & Coalmont area. Across the lake is the Trans Canada Trail. Facilities: 45 campsites, day-use area, boat launch, pit and flush toilets. Location: 33 km north of Princeton on Coalmont Road towards Coalmont and Tulameen. Once known only by local fishers and their friends, the park is being discovered as a weekend destination from the coast and from the Okanagan. The Coquihalla and the Hwy 97C Connector have made the access easier to these beautiful fishing lakes. This is also an excellent spot for small mammals and large bird species. 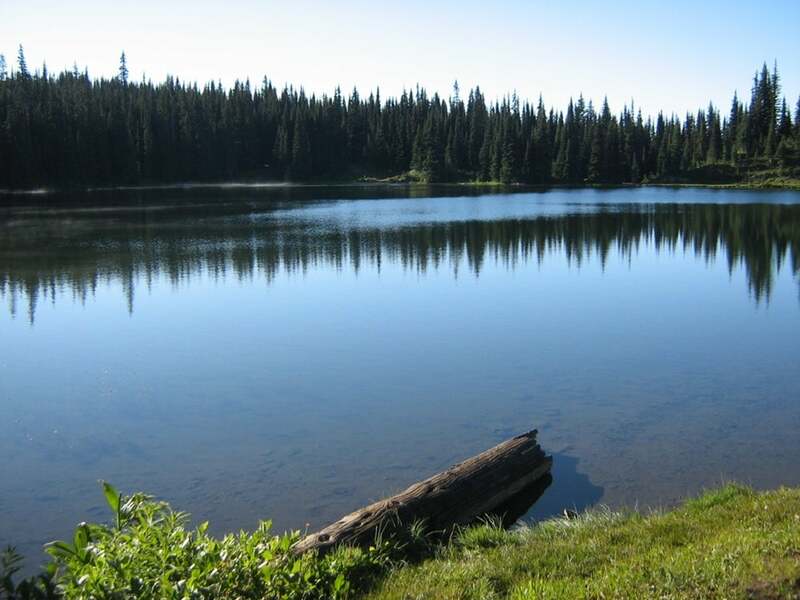 Off the beaten track, you’ll find tree-bordered Allison Lake, a great spot for swimmers and those who love to fish. The park is known for its spectacular stands of aspen that burst into golden colours in the fall. This is a great overnight spot when travelling between Merritt and Princeton. It has a well-shaded grassy area with picnic tables, a water tap, and a small beach. Motorized boating is allowed with public boat access located at the South end of the lake. 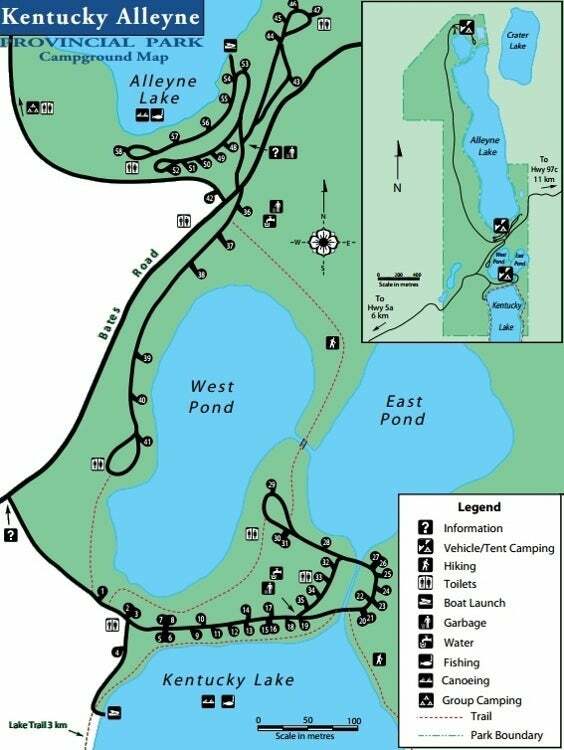 Facilities: 24 campsites and a day-use picnic area next to the lake on the South end. Location: 28 km north of Princeton along Highway 5A. Cathedral Park is a very popular hiking area, but the season can be very short due to the high elevation and potential for snow. The season is generally the end of June to early October. No vehicles are allowed into the core area on the private access road. Cathedral Lakes Lodge provides jeep transportation service (fee for service) from the base area to the Lodge next to Quiniscoe Lake in the park's core area, 16 km away. Location: 3 km west of Keremeos off Highway 3. Take Ashnola Road from the highway and cross a red covered bridge. 10 km later the pavement ends and the Ashnola Forest Service Road, which leads into the park, begins. This road extends 48 km upstream to the south end of the Ashnola Valley. 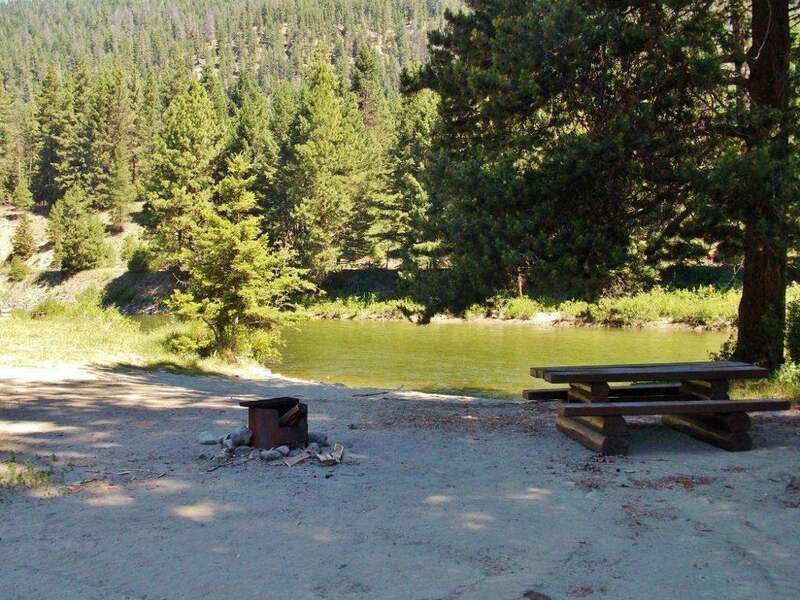 A small pine-dotted camping area beside the Similkameen River, this park is a popular choice for a relaxing picnic. Anglers may try their luck from the rock-covered shoreline. 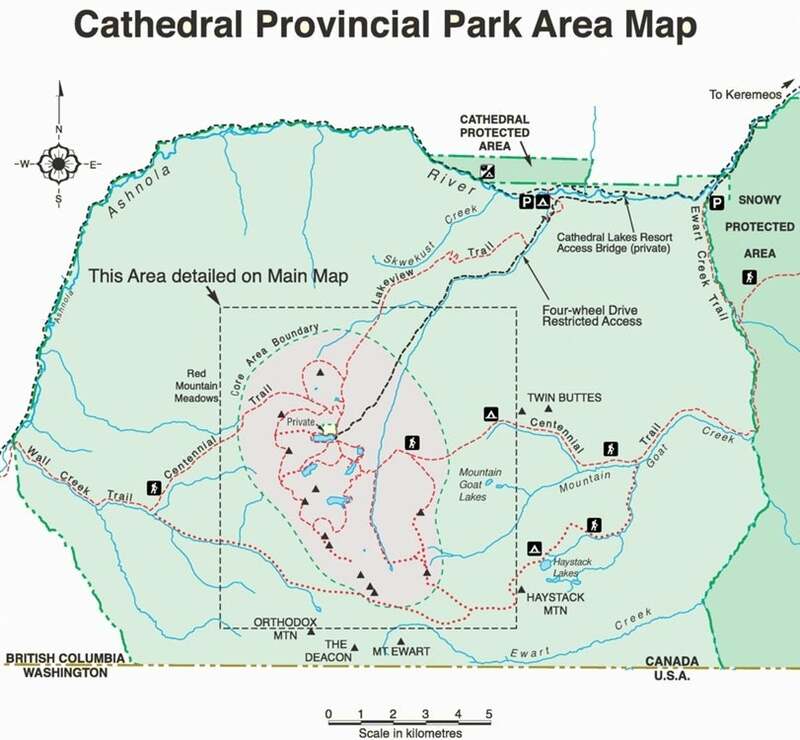 The park is located about 35 km east of Princeton on Hwy #3 near Hedley, BC. Facilities: 26 campsites, hand water pump, pit toilets. Location: 35 km east of Princeton on Highway 3. A popular rest stop at a rock bluff with an inviting sandy beach along the Similkameen River. Located 21 km east of Princeton on Hwy 3, the small park is a great spot where swimmers can enjoy a refreshing dip in the water. The campsites are located in a pleasantly-forested site with a view of a striking rock bluff along the river. Hiking in the area affords good views of the Similkameen Valley. Tubing and kayaking is also popular here giving a downstream route to Stemwinder Provincial Park. Facilities: 17 campsites and day-use area. Location: 21 km east of Princeton on the Similkameen River right off Highway 3. Used primarily by fishers and hunters, the recreation site is accessible by very rough 4x4 via obscure backroads. Not suitable for trailers of any sort but 4x4 with campers or tenting with a 4X4 is ok if caution is taken. The site is also used during winter months for snowmobile activities. Location: Located 23 kms north of Princeton off Highway 5A just east of Allison Lake. 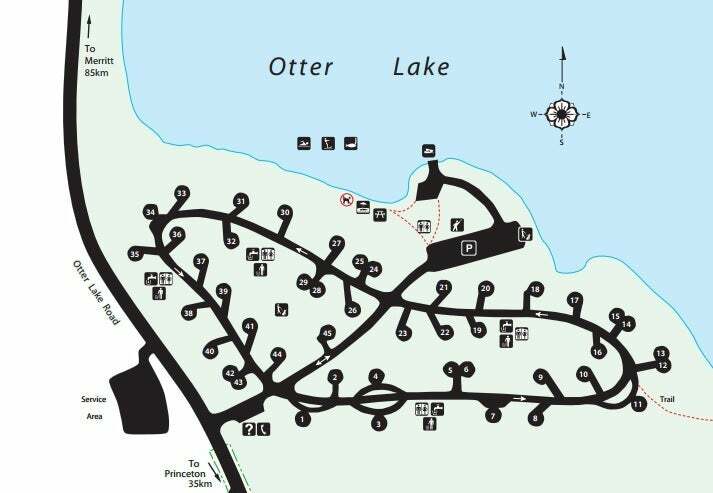 Access is from the 14km point of Dry Lake Road onto a gas utility line heading north for 5.5 km, then take the right fork to the lake and continue for 400 m.
Also known as Hans Lake, the recreation site on Rampart Lake is popular with fishers, campers, and hunters. No ice fishing allowed. Location: Drive 9 Km northeast of Princeton on Hwy # 40 then turn left off the highway onto Hembre Mnt. Road and continue to Jura Road. Drive to the 13.5 Km mark, then turn left and drive 2 km staying to the left. Entrance on the right just before the creek into Rampart Lake. The recreation site is popular with fishing, hunting and camping enthusiasts. Location: Access is from Highway 5A and then Hornet Lake Forest Service Road. 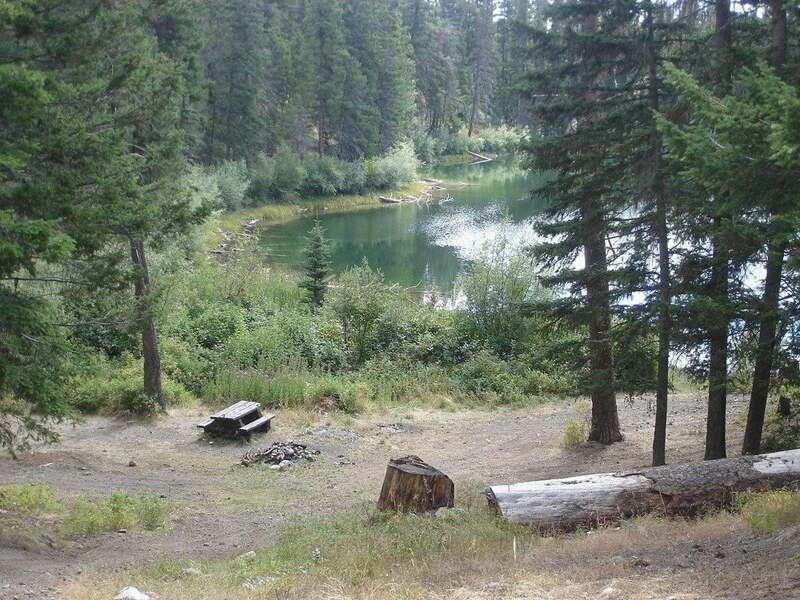 The small sub-alpine Placer Lake recreation site provides camping, hiking and fishing opportunities. 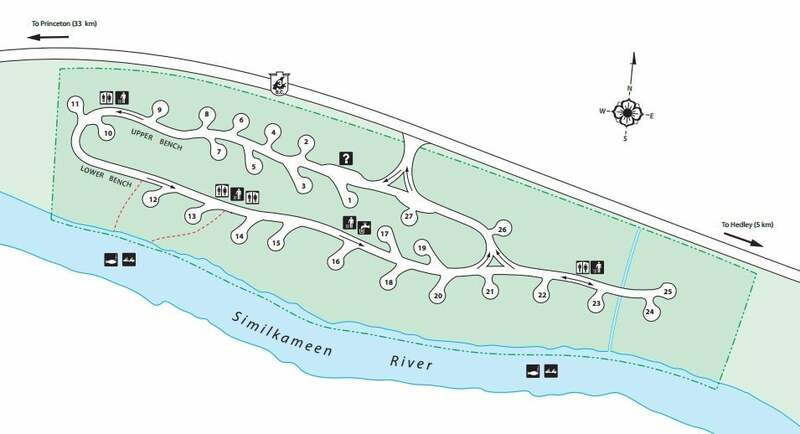 Vehicle access is only recommended to within approximately 1.5 km of the site. From there, a short hike will bring you to the lake. Due to access, float tube/belly boat fishing is quite popular at the lake. Location: Follow Hwy 5 south from Princeton for 39km where you will turn left onto the Placer Mtn Road. Go over the bridge and stay right at 1.5km and 9.5km. Do not go onto the Upper Placer Road. Turn right onto the Calcite Road at 12 km, turn left at 14km onto the Placer Bobcat Road and follow to the 19km marker. Turn left, use 4 wheel drive, go to the 20.5 km mark where there is a Placer Lake parking lot sign. Park here and walk up the 600 metre rough road to get to the campsite. The recreation site is used mainly by campers and fishers, but the nearby Kettle Valley Railway is a popular destination for hiking and mountain biking enthusiasts. Location: Located along the Princeton-Summerland Road 43km northeast of Princeton on Hwy # 40. The recreation site is a popular location for fishers, hunters and campers. Location: Access is from Highway 5A via Hornet Lake Forest Service Road and then Hornet-Loosemore Forest Service Road. The recreation site is a popular camping location, with fishers enjoying the lake. The scenery in the area, and a number of nearby trails are also some highlights that can be enjoyed while at the site. Location: From the town of Coalmont head south across the river, turn left onto Rice Road. Follow for 1 km and then turn right onto Blakeburn FSR, continue to 13.1km then left onto 0km Lodestone FSR. Continue another 8.4 kms on very rough 4X4 road to lake. The recreation site is used mainly by campers and fishers, but the nearby Kettle Valley Railway is a popular destination for hiking and mountain biking enthusiasts. Some ATV and motorcycle use within this camping area. Location: Located 42 km northeast of Princeton on Hwy # 40. Campground is just off the the Princeton-Summerland Road. Take Agur Road right off of Hwy # 40 at 40.8 km and follow road 2.4 km to the camping area. The small recreation site is reached by a hike (aproximately 2 km), from the nearest road access point. The site is mainly used by fishers. Location: Located 33 Km west of Princeton on Hwy # 3. Turn north on Sunday Summit Forest Service Road and continue to the 15.7 Km mark, take the right fork and drive 2 Km to trailhead and parking area. This is a small roadside recreation site that is popular with canoeists and kayakers paddling on the Similkameen River. It is also a trail head location for the historic Dewdney Trail. A great descriptive kiosk of the old trail is on site. Location: Located only 10 minutes east of Princeton on the Old Hedley Road. Starting near the town of Princeton and from the junction between the Princeton-Summerland road and Old Hedley Road, travel east along the Old Hedley Road for approximately 6 kms. The recreation site will be on your right overlooking the Similkameen river. The recreation site is a popular location for fishers, hunters and campers. There is rough boat access to the lake down a steep hill. Location: Access is from Highway 5A via Hornet Lake Forest Service Road and then Hornet-Deadman Forest Service Road. Rough 4x4 access, 2 wheel drive vehicles are not recommended. 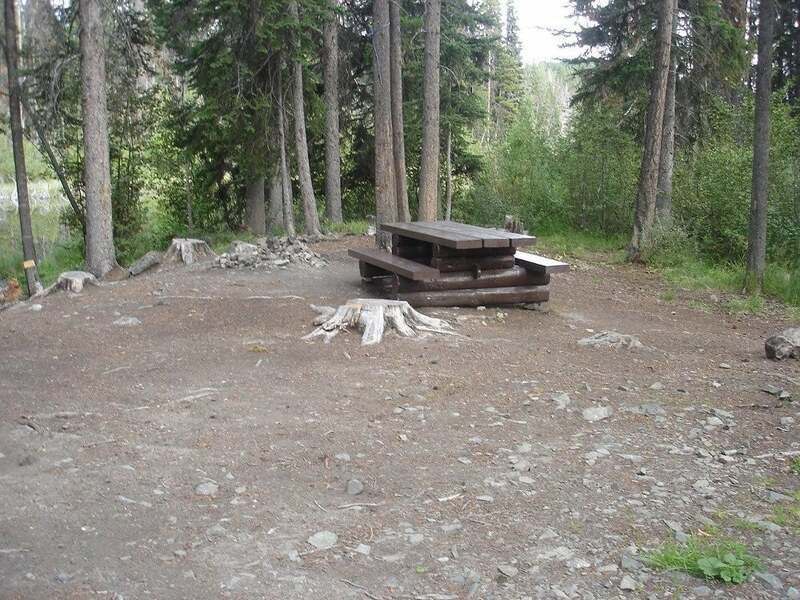 A great picnic, rest, or camping spot at the junction of the Paysaten River and Copper Creek. This site has 5 level camping areas. Also a great spot to stop and rest for a while when travelling along Highway 3. Location: Located just off Highway #3, 39 km west of Princeton on the Placer Mountain Forest Service Road at 0.2 kilometer. Location: Located at 1190 m in elevation, northwest of Princeton, access is via West China Creek Road and then onto Snowpatch Road which is maintained by highways. About an 8 km drive up this road. Well signed. Location: Located northwest of Princeton. Drive to the main parking lot of the club located approximately 8 kms up the Snowpatch Road. Then proceed by xc skiing or other non motorized means to the hut. 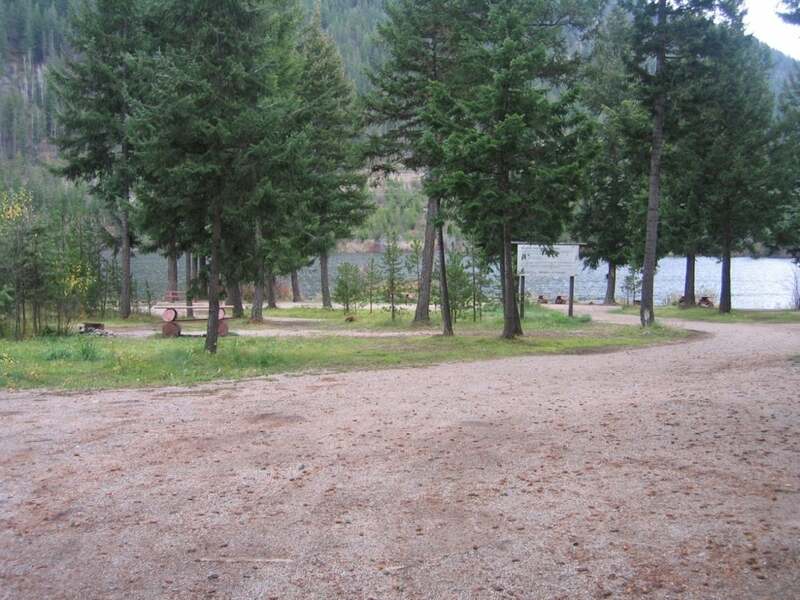 Found in a semi-open area next to the lake, this popular and busy recreation site is easily accessed with RV units. The site is used mainly by campers and fishers, but the nearby Kettle Valley Railway is a popular destination for hiking and mountain biking enthusiasts. Location: Located just off the the Princeton-Summerland Road, 36 kms northeast of Princeton on Hwy # 40. The recreation site provides camping along the Similkameen River. Kayaking, canoeing and swimming in the river are popular activities at the site. Location: Located approximately 6 km west of Hedley (32KM east of Princeton) along Highway 3. Access is on the left hand side, when driving westward, just before the Sterling Bridge. Located between Highway 3 and the Similkameen River. The recreation site provides camping along the Similkameen River. Kayaking and swimming in the river are popular activities at the site. Location: Located off Highway 3, 30Km east of Princeton or about 8 km west of Hedley on the Old Hedley Road which runs on the north side of the Similkameen River. Location: Located off Highway 3, 31 Km east of Princeton or 7 Km west of Hedley on the Old Hedley Road. The popular recreation site at Granite Creek supports a number of recreational activities on and along the Tulameen River. Popular activities include hiking and mountain biking the nearby Kettle Valley Railway and paddling in the river. VUICH RECREATION SITE: (34.4km) Forested three vehicle campsite with a nearby trail that views the cascading waters of Vuich Creek (33.9km). 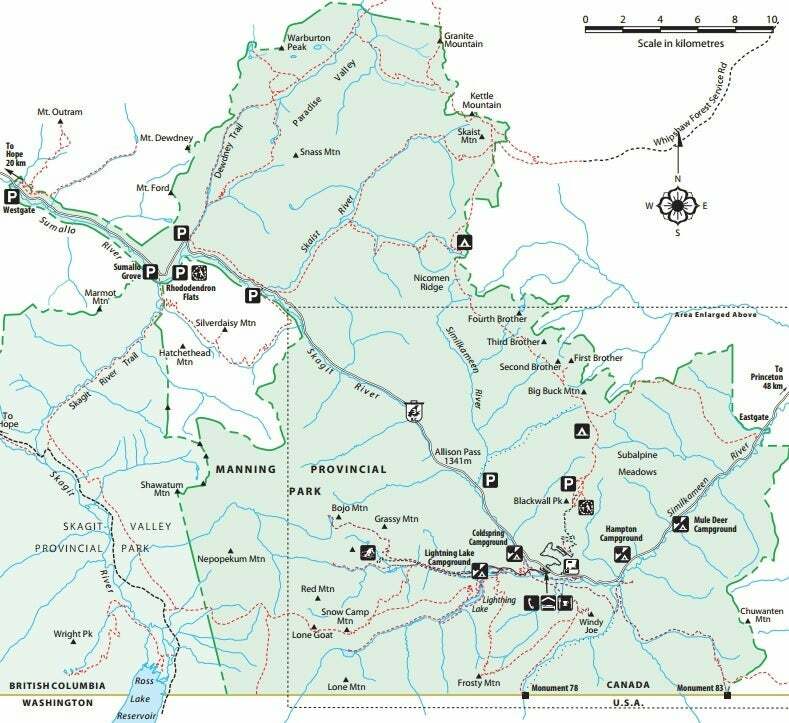 SUTTER CREEK RECREATION SITE: (34.6 km) Serene three vehicle campsite perched on the high banks of Sutter Creek. Bright and open site nestled alongside a rushing mountain stream. 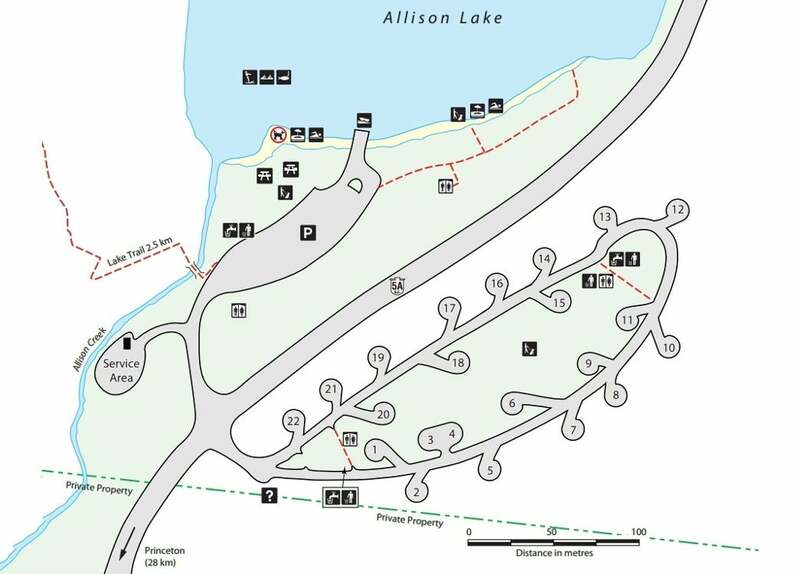 JACOBSON LAKE RECREATION SITE: (45.8km) Treed six vehicle site with horse corrals and additional vehicle parking for trail users. Trailhead for the "Treasures of the Tulameen" complete with information kiosk and map. Brochures will be available at this location.